There are several ways to safely and properly dispose of a fridge, mini-fridge, or freezer. The right choice for you will depend on the condition of the appliance and the recycling facilities in your area. Whether you’re upgrading to a new model, throwing out a broken fridge or downsizing to apartment-size appliances, here’s what you should consider when disposing of your old fridge or freezer. The short answer is: yes. 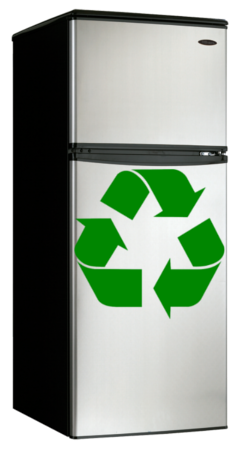 Refrigerators and freezers contain recyclable glass, plastic and metals. However, certain parts of a fridge must be recovered and disposed of properly before the rest of the appliance can be recycled. Refrigerant: The compressor and evaporator coil contain a chemical compound called refrigerant. Refrigerants contain toxic, ozone-depleting chlorofluorocarbon (mainly in fridges manufactured before 1995) or hydrofluorocarbon, which contains greenhouse gases. All components containing refrigerant should be properly reclaimed and disposed of by a professional. Insulation: Many refrigerators manufactured before 2005 contain foam insulation made with ozone-depleting substances. These appliances should be dismantled and reclaimed by a professional. It’s never safe to remove compressors, refrigerant or insulation from a refrigerator yourself. Leaving an it on the curb isn’t a good idea, either, since you’ll have no way to ensure it will be disposed of properly. The safest, most responsible way to recycle or dispose of a refrigerator is to ask for help from a professional. Many organizations will help you properly dispose of a fridge for free; others will even reimburse you. Municipal waste management may offer a curbside appliance collection program on certain days of the year or pick up the refrigerator from your home on request. Local electrical or gas utilities may run appliance recycling programs. Those that do often offer incentives to donate appliances for recycling. Transfer stations/waste management facilities may have the resources to properly dispose of a refrigerator on-site, if you have a way to transport it there. Call ahead to find out before you go. Your state or provincial government will likely have a website with information on appliance disposal in your area. Some have their own recycling programs as well. Private companies offering refrigerator pick-up and disposal are an option if no public resources are available. Be sure to verify that the company will properly dispose of the appliance first. Just like full-size refrigerators and freezers, mini-fridges contain insulation and refrigerant that should only be handled by a professional. The same guidelines for safe fridge and freezer disposal also apply to a mini-fridge. If your local waste facility or appliance collection program takes fridges, it’s likely that they’ll dispose of a mini-fridge as well. However, since mini-fridges are easier to move by yourself, they may not offer the convenience of curb-side pick-up. If the appliance has been in storage, test it before you donate. The refrigerator may not be working as well as it did (or at all) when you last used it. This simple step will save the charity the trouble of recycling a broken refrigerator. Depending on where you live, you may be eligible for a tax receipt for your donation. If you’re not sure, it doesn’t hurt to ask! Be mindful that older refrigerators are less efficient than newer models. While donating a refrigerator for resale is generous, but it can also contribute to increased energy consumption and greenhouse gas emissions. Weigh the benefits of recycling vs. donating and decide which option is right for you. We hope this guide clarifies what you need to consider when it comes time to properly dispose of your refrigerator, mini-fridge or freezer. Enjoy your new appliance! 5 Ways to Use a Mini-Fridge — Think beyond using it as a dorm room snack-stash. How to Give Your Fridge a Spring Purge — You’ll be amazed how much space you’ve freed up. How to Defrost a Freezer — …And avoid a puddle-related mishap in the process.